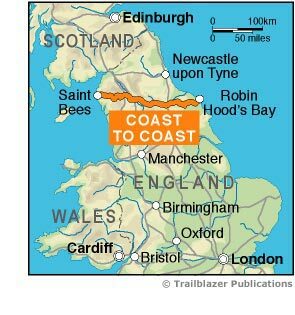 It would be impossible to do this route without a copy of the superb Coast to Coast Path by Henry Stedman and Daniel McCrohan (Trailblazer). The maps are clearer and more easily read than Wainwright's. The numerous detailed walking maps ... make planning your hike all the more easy. You could pick this book up and never use another resource from the first stages of planning to arriving in St. Bees. The most complete guide: with all the detail you'll need for a walk in Wainwright's footsteps. We were very impressed by your guidebook & I used it not only for the walk but also for booking B&Bs etc. An outstandingly good value and very useful guide. Just like the Hadrian's Wall guide which we used a couple of years ago, it has been a huge help in both planning and doing the walk and really added to our enjoyment. Downloadable GPS waypoints and tracklog also included.